Firearms safety is the responsibility of every user of firearms. If you can’t follow them, all the time, then don’t carry one. This is a reminder of what happens when you disregard them! I am so grateful that this Good Samaritan had the courage to help this officer. 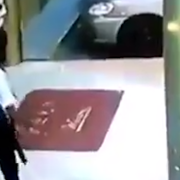 Would you have stepped in or filmed on your phone? If you value what we do at ASP, would you consider becoming an ASP Patron Member to support the work it takes to make the narrated videos like this Good Samaritan helping? https://get-asp.com/patron gives the details and benefits. 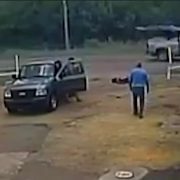 What does this video teach us about defending ourselves against an attacker and being a Good Samaritan? Part of your training must be knowing when to use verbal commands, and when to abandon verbal commands and move to physical or deadly force. Many times self-defenders (and LEO) get caught in a loop of issuing the same command repeatedly to no effect. Using verbal commands is an important part of your force options training, and part of that training in verbal commands is knowing when to talk and when to stop talking and act. The Good Samaritan gave the suspect a LOT of opportunities to comply here. Like more than he needed to. Empty-handed skills are absolutely critical for self-defenders. First of all, more conflicts you will encounter as a self-defender will require empty-handed skills than will require firearms skills, simply because more self-defense encounters are physical than deadly. Second, since a firearm is a tool of last resort, self-defenders need to have non-lethal options that include empty-handed skills to protect themselves from likely incidents. Third, in the moment of the encounter you may not have the time to get to your gun before you can fight your way to it. 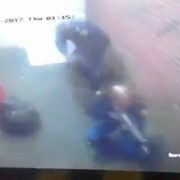 We don’t get to see what happened with this officer to get him to the ground, but being able to fight from a grounded position and protect yourself is a necessary skill for firearms users! Marksmanship in a real deadly force encounter might mean that you need to be ready to make a precision shot on a threat, and you must be prepared emotionally and skill-wise to do so. Shooting a threat in the face, a target the size of a 3×5 card, under stress is no small feat! To be able to stop a terrorist attack or hostage situation, though, it is a necessary skill and you should train and practice your marksmanship until it is second nature. A good standard is Dave Spaulding’s “Skill on Demand” drill, which involves 2 shots in 2 seconds at 20 feet, in a 3×5 card. This is one such instance, where a precision shot was really needed to get the perp to stop attacking the officer. 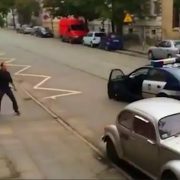 Whether LE or CCW, there is a lot to learn from these Polish Police confronting a deranged man who is threatening the local population. If you value what we do at ASP, would you consider becoming an ASP Patron Member to support the work it takes to make the narrated videos like these officers confronting this deranged man? https://get-asp.com/patron gives the details and benefits. 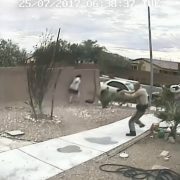 What does this video teach us about defending ourselves against someone armed with short range tools like a hammer and crowbar? You must know the range of your force multiplier and the range of various force multipliers that might be used against you. Hammers and crowbars are short-range, fast moving force multipliers. If thrown, they become single use, long range force multipliers. Firearms are extremely long-range, fast moving force multipliers. Whether you’re LEO or CCW, you need to know what force options you have available and when to abandon one and move to another. (“force options” are a better model than the older “force continuum” model) You need to know when your pepper spray is the best option, or when to abandon it (or the TASER) in favor of your firearm in a split-second decision. The best way, of course, to learn and embed these options in your mind is to train in force on force scenarios with the options and then respond to the situations appropriately. Against a hammer and crowbar, a less-lethal option like a TASER or OC spray wouldn’t have been appropriate. If you value what we do at ASP, would you consider becoming an ASP Patron Member to support the work it takes to make the narrated videos like this deadly force encounter? https://get-asp.com/patron gives the details and benefits. The officer won this deadly force encounter with an armed suspect with only FRACTIONS of a second to spare. This is how fast gunfights go down! What does this officer involved deadly force encounter teach us about defending ourselves from an attack? Evil exists in our world, and no amount of wishing it away does so. Evil people do evil things, and good people must be ready and willing to stand between them and innocent people and do enough violence to stop them definitively. No amount of negotiation will make truly evil people change their ways; only those willing and able to stop them who use attitude, skills, and plan effectively can. This suspect had EVERY chance, and he chose to do evil. 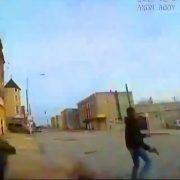 Pointing a gun at a police officer is a great way to die, simple as that. The eyes may be the windows to the soul, but the hands are the windows to the intent of a person. If you’re in a potential conflict, ALWAYS pay attention to what the aggressor is doing with their hands. They might have a force multiplier in their hand, or they might be hiding their hand so that you can’t see what is in it or using their hand to conceal something. If their hands are empty, there is a difference between someone with fists and someone whose hands are open and relaxed. As a self-defender your situational awareness must include seeing the hands of any potential threat in your vicinity, so watch the hands! Officer Kinland saw the gun in Deal’s hand, and because of that was able to act. The “fleeing felon rule” generally applies to Law Enforcement Officers in the performance of their duties, and since 1985’s Tennessee vs. Garner decision the ability to use deadly force to apprehend a fleeing felon by LEO has been limited to cases where the officer has probable cause to believe that the fleeing felon is a continuing threat of serious physical harm to the officer or the public. However, how that law applies to non-LEO varies state by state. Make sure to know your local laws so that you know the limitations of shooting a fleeing felon, especially if you’re not a police officer. 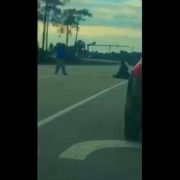 This deadly force encounter isn’t really about shooting a fleeing felon because Deal turned and raised his gun at Officer Kinland, but the point is still worth reminding us all about. A gunfight is chaotic and stressful, which is what we see in this officer body cam for sure. It’s another reason to train your firearm safety skills to the point of unconscious competence! What does this officer teach us about firearms safety in a gunfight? It’s not easy to drop what’s already in your hands to put both hands on the gun. In the moment of a gunfight there’s a tendency to keep whatever is in your hand where it is and shoot one-handed, though of course two-handed shooting is faster and more accurate. It’s worth it to train with something in your hand or hands that you have to drop to get your gun, just to be in the habit of dropping it when the need arises! It’s also a smart idea, if possible, to have a light on your firearm (I use this one: http://amzn.to/21qy0aW if you’re interested) so that when the gun comes out you have a bright light to illuminate your target while keeping both hands on the gun. It takes great training to do successfully, but it’s worth noting that moving backwards should be our least preferred method of gaining distance in a gunfight. When you’re moving backward with a threat in front of you it is very easy to hit an obstacle and lose your footing, which allows the threat to close the distance while you’re off balance. If possible, move diagonally or laterally to get “off the line” of attack and still engage the threat with your firearm. 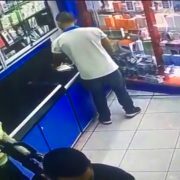 If you think you’re immune to negligent discharge of your firearm, you’ll get complacent like this guard in a retail store did. And then, you’ll have a negligent discharge. Hopefully you don’t kill someone in the process. Learn and remember the rules of safe firearms handling! If you value what we do at ASP, would you consider becoming an ASP Patron Member to support the work it takes to make the narrated videos like this negligent discharge caught on camera? https://get-asp.com/patron gives the details. 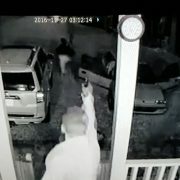 What does this video teach us about the administrative gun handling and negligent discharge? The second rule of firearms safety is to keep your finger off the trigger until you’re ready to fire! I like to bolster that rule by framing it as “keep your fingers completely out of the trigger guard until you’ve decided to fire.